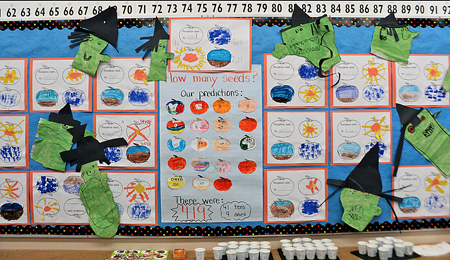 Part of our Grade 1 science curriculum is the needs of plants. I was trying to think of a way to jazz it up a bit this year and I came up with this. 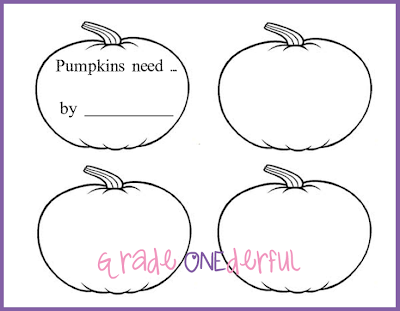 I enlarged the image above (you can click it to grab) on our school photocopier to 11 by 14. 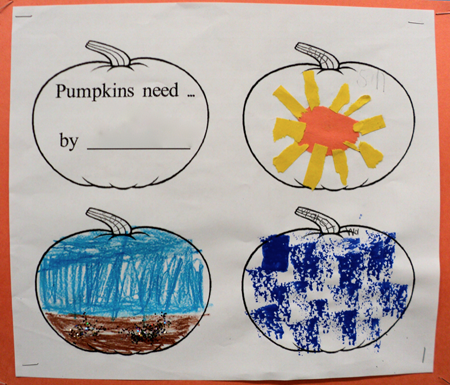 Below each of the three pumpkins I asked the children print "sun", "soil" and "water". I gave them small pieces of orange and yellow construction paper and had them rip or cut the paper into a sun shape, complete with rays. For soil, the kids coloured a brown area with their felts, smeared on some glue stick, and we sprinkled on gold glitter (I was thinking about how sometimes compost is called "black gold"). And actually, I couldn't find gold, so it's multi-coloured glitter -- ha ha! For water, the kids met with me and sponge-painted blue onto their pumpkin shape. You're welcome, Sarah. The kids had fun with it! Thanks. I hope you can use it. I love it! Especially the way you had the kids show each "need" with a different medium. Thanks for sharing this. Thanks, Chrissy. It's all my tired brain could come up with yesterday, but I thought it might help to cement the ideas. Very creative! And makes a wonderful display too! Hi Barbara - So cute and very creative!! I LOVE this!! Thanks for sharing. You gals are making me want to teach first grade again!! !